I don’t want to start explaining what is “the internet of things” because it’s a really huge topic, but I’m here to share my first experience into connect an iOS device to a micro controller called Pinoccio and what that means. What is Pinoccio? am I missing an “H”? Is really hard to describe it, I’m really proud about being a funder of this project on indiegogo. 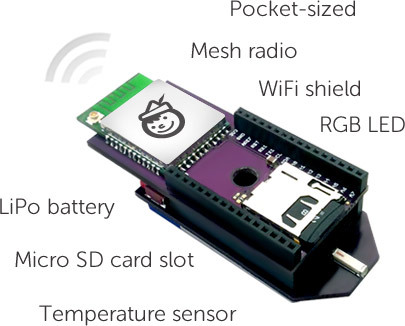 Pinoccio at a first first look seems to be like a pumped Arduino with a WiFi shield and mesh radio communication. If you are wondering.. yes is compatible with the Arduino IDE and you can compile your own custom firmware, but do we really need that? Building a firmware with the Arduino IDE that include a network library, shield communication can be really frustrating, if you are not familiar with micro-controllers, is really a long hard road. For instance the memory is a big problem into creating a sort of web-server that can run into a micro-controller. One of my first desire when I ‘ve got my first iPod Touch was to connect my device on everything and when I started to build my own applications using the iphone sdk, I always tried to figure out how to do that, but I’ve found huge obstacles that I wasn’t still prepared to tackle. In the earlier realeses of iOS version wasn’t possible to connect the iphone to a sort of prototype board, well not exactly but I have should enroll to the made for iphone/ipod program and the process wasn’t really easy. The accessory framework had very few documentation available to the public. Now we can use the Bluetooth LE to connect with an accessory but it seems to be locked for 1:1 connection (but I’m not totally sure about it, for instance the multipeer connectivity can connect up to 8 devices). Then I started to use Arduino a little, but the problem was still the connection between the 2 devices, the only option was using the ethernet shield, build something like a webserver and access Arduino pins with a sort of web services. Not so easy and also with a lot of limits about memory, bottlenecks etc in my mind I couldn’t find a way to do something that could be ready for production. Later Redspark started to sell a cable (in compliance with the made for iphone program). With this cable is possible using the serial communication to make an Arduino talk with an ios device, but under current Apple policy this cable may not be used with apps sold on the App Store. Then I’ve found ElectricImp, I was really interested into that project but when I heard that I would always need to stay bounded to their cloud platform I gave up, but the Imp is a really cool device if you accept that limitation (or feature). On Febraury 2013 during an Indiegogo campaign I heard about Pinocc.io it was love at first sight. It is a really small and cool prototyping board. They are making an FCC certified version for production of a size of a nail. You can build you own firmware in the old Arduino way. You can use a scripting language to communicate with it from a web terminal (and via REST). You can log it and launch those script commands using REST webservices. You are not bound to use their platform. You can create your own mesh of pinocc.ios and only one of them need to comminicate WiFi. It’s pretty clear that you can do almost everything you want. The idea here is to send all your request to their (or yours) platform and read or write properties with simple calls on the the platform, and this is a reallu smart idea, because most probably the platform manages the traffic on the board, maybe also caching some responses, avoiding bottle necks or massive requests. To make a simple example about how this board connected to you iOS device can be powerful, I’ve made an easy app that asks the on-board temperature of the two scouts. We have a lead scout (Optimus Prime) with the Wi-Fi backpack on it and the other scout (Bumble Bee) that communicates through the lead scout. The lead scout is installed in my home and the other outside – of course the on board temperature is not the real environment temperature because is due to the load of the CPU and the environment temperature itself-. A video can be found here. This is a simple example but let me try to figure out something bigger. Let’s imagine that each scout has a Bluetooth LE backpack and a simple OLED display installed in a shoes shop. Each shoes has its own scout (like a price tag) with the display that shows the like/reviews numbers. Each scout sends an iBeacon signal to identify a specific product close to them. When a user get close to the product using the shop application connects to that scout/ibeacon and get the product details, there is also the possibility to “like” it, once the use press like on the phone the like number on the display is incremented almost in real-time. The other interesting example could be to measure the energy consumption of our house integrating a hall effect sensor on each scout and display data in a cool web page or into your mobile phone. Arduino in my opinion created a revolution opening the market to all those boards, these is just the beginning because the revolution of the DIY is cultural and educational. I hope to have more time to play around using Pinocc.io and this is the first time that I feel I have something “ready for production” and not just a new cool R&D gadget. Quanto le applicazioni mobile assomigliano a quelle per il web e viceversa? Il mondo di internet e quello ... Read more! Le App? Nella stragrande maggioranza dei casi le troviamo gratuite al ... Read more! Bella invenzione di un team texano: un termometro da cucina da collegare all'iPhone. Anche se Natale è ... Read more! Di recente ho dovuto “smanettare” per un bel po’ di tempo sulle Read more! Dopo aver parlato di mamme e del legame tra e-commerce e mobile, ci occupiamo ancora dell’universo femminile, ... Read more! I'd like to speak about liveness, it has been introduced in Xcode 6 and along with storyboard and interface ... Read more! Parallax iOS7, come riproporlo su sistemi precedenti? I video di iOS7 hanno sorpreso tutti quanti per l'interessantissimo effetto di parallasse. Ma come ... Read more! Sembrano passati anni luce da quando BlackBerry dominava su tutti. Prima simbolo ... Read more!